Thinking of hosting a theme night? Over four big nights in June, The Guildford Hotel hosted a Harry Potter themed event “The Great Hall Feast”. PAV Complete Event Solutions played a big part in bringing the theme to life. Their in-house Set Designers got to work on recreating Platform 9 3/4 complete with Hedwig…eat your heart out Warner Bros! 100 hanging LED pillar candles as well as house banners were used to engineer the Great Hall. 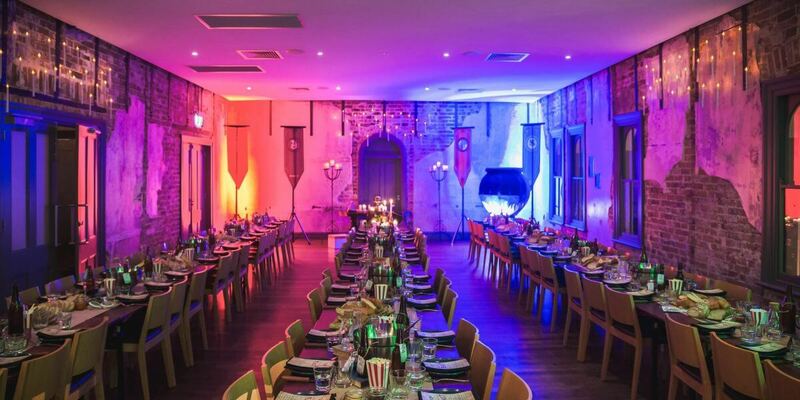 When they’re not wearing their Hogwarts robes, PAV are Perth’s leaders in AV hire, supply and installation and specialists for venues, both in-house and as preferred suppliers. When it comes to their theme and styling division, they’ll take your brief and deliver something spectacular. They design amazing spaces and bring events to life and also house fantastic backdrops, lecterns, centrepieces and event furniture. If you have an event idea you want to bring to reality or have any AV requirements, contact PAV’s friendly and professional team today.